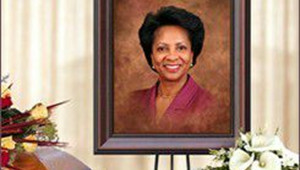 Portraits can be used at both funeral and memorial services, at the funeral home and at the church. They can even be taken home and hung on the wall as they come with a frame. 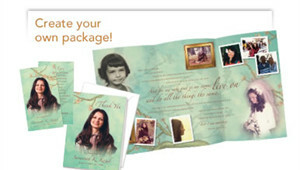 Artists create a personalized portrait from the photo you bring in for us to scan. Over 50 exclusive background designs to choose from, and 3 frames to choose from. 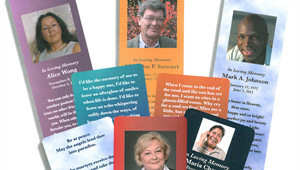 Memorial Cards, Traditional Cards, and Bookmarks are printed on long-lasting, water-resistant NeverTear polyester paper and finished with rounded corners. These cards and bookmarks will last much longer than traditional paper cards and bookmarks, eliminating expensive lamination. Tribute Blankets are large and impressive, yet soft to the touch. 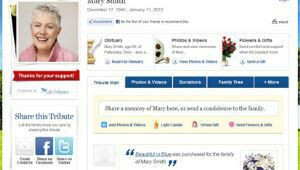 The blanket is easily hung at a cremation memorial on a floral display rack or at a viewing draped over a casket. What makes the product unique? 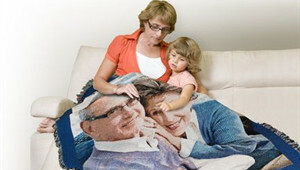 These blankets are unique because the image is woven into the blanket–not simply printed. They are machine-washable, non-fading, and designed to be well-used, loved, and cherished. Much like Linus’s security blanket, these are more than just blankets: they are allies, offering you comfort and a point of stability in a world that often feels like it’s spinning out of control. BerylMartin offers a wide variety of beautiful, personalized funeral tributes, including programs, prayer cards, thank you cards, portraits, cap panels and photo crystals. Their product line of original designs has been a funeral industry staple since 2000, and they currently ship to hundreds of funeral homes nationwide, including Fremont Chapel of the Roses. You knew your loved one better than anyone else. We’ve got years of experience. Together, we’ll design the perfect memorial or funeral service for your loved one. If you're ready to discuss the options, or simply have questions about our services, please call us at (510) 797-1900, or send us an email inquiry.